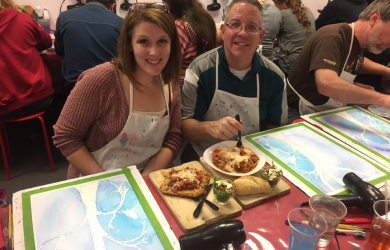 $54.00 for $108.00 - A Wet Palette Paint Party of Your Choice for Two People, a $108 Value for ONLY $54! Bring a friend or make it a date night..... one voucher is valid for TWO people!!! 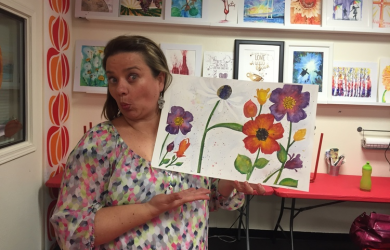 Wet Palette Uncork + Create Studio is where art meets entertainment! Now offering a full FOOD + WINE menu as you create. An evening of painting often turns into a full-fledged party! Come check out our NEW Studio Location in Richland, WA. 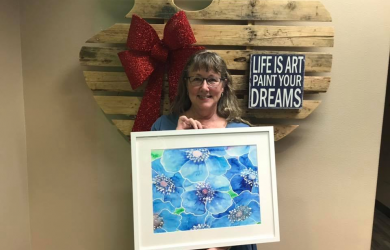 The Wet Palette is a local, family-owned and run painting studio. 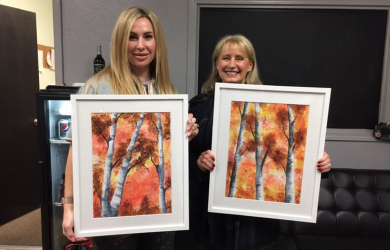 Our talented Artist and teachers will guide you and your friends, stroke by stroke, through the creation of your very own watercolor masterpiece using our unique fail-proof watercolor process. After just a few hours of socializing you will be amazed at your work of art. At the end of the event, you will leave with a wonderful sense of accomplishment and a beautiful, original watercolor painting ready to hang on your wall! 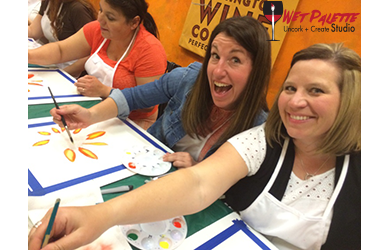 In addition to scheduled sessions at our Wet Palette Studio - The Wet Palette Uncork + Create Studio is available for Private Events - Morale/Team Building, Bachelorette Parties, Bridal Showers, Baby Showers, Corporate events Fundraisers, Birthday Parties and MORE! Visit www.wetpaletteparty.com and use your Spotted Fox promotional voucher code in the “Promotional Code” field at check out. Good for entry for 2 people to the same paint party. Valid only at the Richland Studio location. Schedule is subject to change, see www.wetpaletteparty.com for up to date events schedule. Vouchers must be redeemed online in advance. Class Space is limited and subject to availability. No cash value, full amount of voucher must be used on one event. Promotional amount valid for parties scheduled through June 29, 2019. Not valid for Paint your Pet Parties, Private Parties, Fundraisers, or Corporate Events. Remainder amount of voucher cannot be carried over into multiple events, frame, food and drink purchases. Does not include tax or gratuities. To Redeem Voucher: visit www.wetpaletteparty.com and use your Spotted Fox promotional voucher code in the “Promotional Code” field at check out. Voucher Codes will be live 24 hours after purchase. Voucher cannot be used for exchanges, substitutions, products or use for gratuity. Paid value does not expire and can only be applied to the same product or service. Limit ONE PER PERSON. Good for entry for 2 people to the same paint party. Valid only at the Richland Studio location. Schedule is subject to change, see www.wetpaletteparty.com for up to date events schedule. Vouchers must be redeemed online in advance. Voucher Codes will be live 24 hours after purchase. Class Space is limited and subject to availability. Cannot be used with other promotions or offers. No cash value, full amount of voucher must be used on one event. Promotional amount valid for parties scheduled through June 29, 2019. Not valid for Paint your Pet Parties, Private Parties, Fundraisers, or Corporate Events. Remainder amount of voucher cannot be carried over into multiple events, frame, food and drink purchases. Does not include tax or gratuities. To Redeem Voucher: visit www.wetpaletteparty.com and use your Spotted Fox promotional voucher code in the “Promotional Code” field at check out. Voucher cannot be used for exchanges, substitutions, products or use for gratuity. Paid value does not expire and can only be applied to the same product or service.